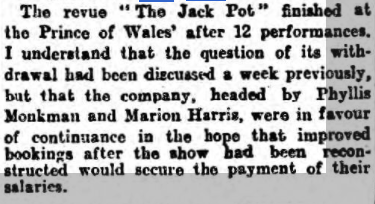 Charles Mortimer was in the cast of "The Jack Pot", at the Prince of Wales Theatre, London, from 11 -21 May, 1932. According to the Era of 25 May, it failed to attract large enough audiences to continue its run. Reviews were negative, as can be seen below! 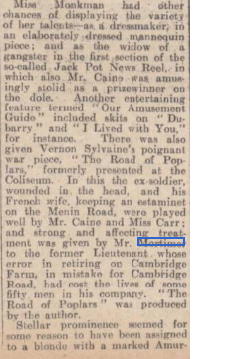 From The Hendon & Finchley Times - Friday 20 May 1932. It would discourage us both, dear reader, were I to pick over this revue plum to plum. For while some of its fruit is fine and large, much of it is indifferent make-weight. 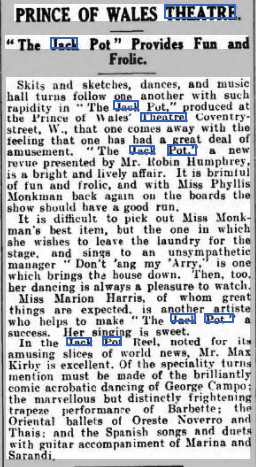 The inclusion of "The Road of Poplars", a one-act play that fills the middle of a bill intended to amuse, seemed to be a mistake; and this as much on account of its nervily sentimental subject as of its stammering treatment. Mr Henry Caine and Mr Charles Mortimer act it well; but it lies, like No Man's Land, between the first part and the last, and lowers the festal temperature. 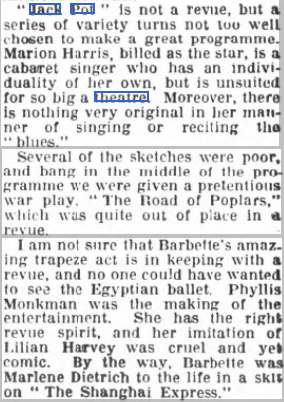 On either hand are such irreproachable turns as those of George Campo, the indiarubber tumbler; Barbette, who flies the middle air on tightrope and trapeze like an incandescent sylph; and Miss Phyllis Monkman, who has not forgotten how to dance, and never fails to be a good comedienne. She is in equally good form, whether diving into low-life, or rising to a wicked burlesque of the film star who queened it in "Congress Dances". 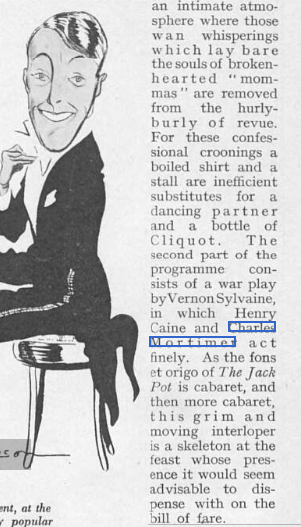 Mr Max Kirby, touching off this and that, gives an excellent imitation of Jack Buchanan; and if the pangs of modern love-a-la-cabaret move you, there is Miss Marion Harris, exquisiteley gowned, to pluck your heartstrings. For the rest, two gilded dancers, wet from the mint, who would not have disgraced Trimalchio's feast; a potted News Reel that successfully snubs some features of the Talkie Gazette; a revue audition, a mannequin parade, and little sketches with the usual sting in rather too long a tale, make up a programme with cutting and composing would strengthen. 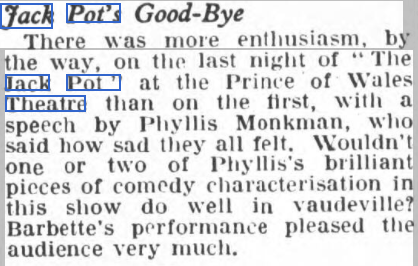 From The Era - Wednesday 25 May 1932. 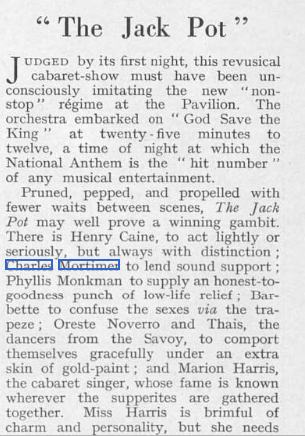 From The Era - Wednesday 18 May 1932. 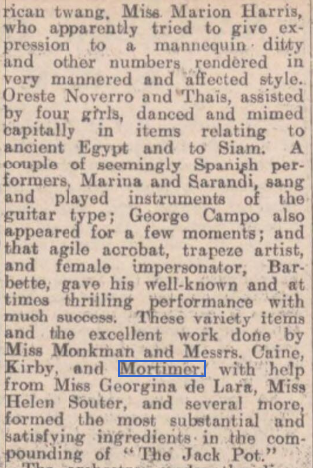 From The Edinburgh Evening News - Monday 23 May 1932.